Even if you’ve been shooting for years and years, there is still plenty to learn when it comes to digital photography in challenging environments. Roderick Eime explains what it means to be in the field, and in the moment, with a National Geographic-certified photo instructor on a Lindblad Expedition. One of the hallmarks of the Lindblad Expeditions' experience is the dedicated Lindblad-National Geographic certified photo instructors who accompany every departure. On my recent voyage aboard the National Geographic Orion from Fiji to Tahiti, I met up with Jack and Rikki Swenson who I’d earlier sailed with in the Sea of Cortez. 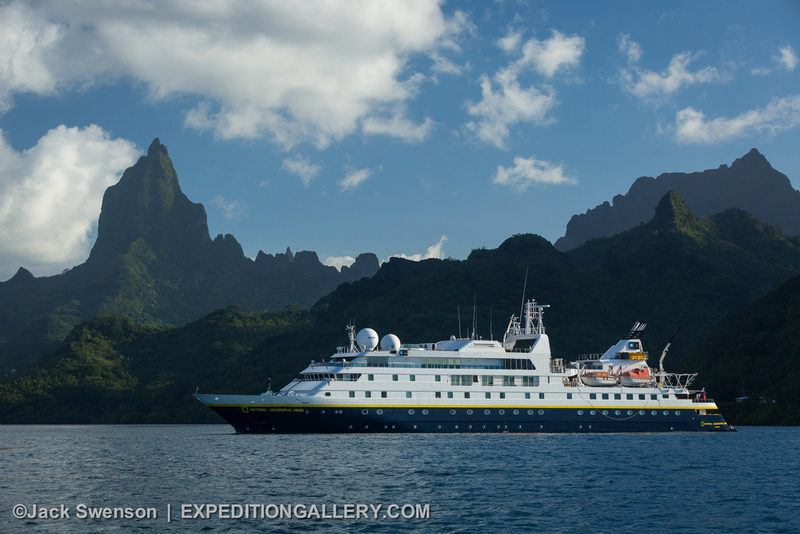 As Photo Expedition Leaders for the Lindblad Expeditions-National Geographic Alliance, the infinitely affable and patient pair are regulars aboard vessels from the Arctic to Antarctica, the Galapagos, Costa Rica and Panama, Papua New Guinea, and the South Pacific. This image: 'National Geographic Orion' in Opunohu Bay at the island of Mo'orea, French Polynesia. All the while the pair are working with guests to produce a video slideshow of everyone’s best work to take home at the end of the Lindblad expedition as a permanent souvenir. 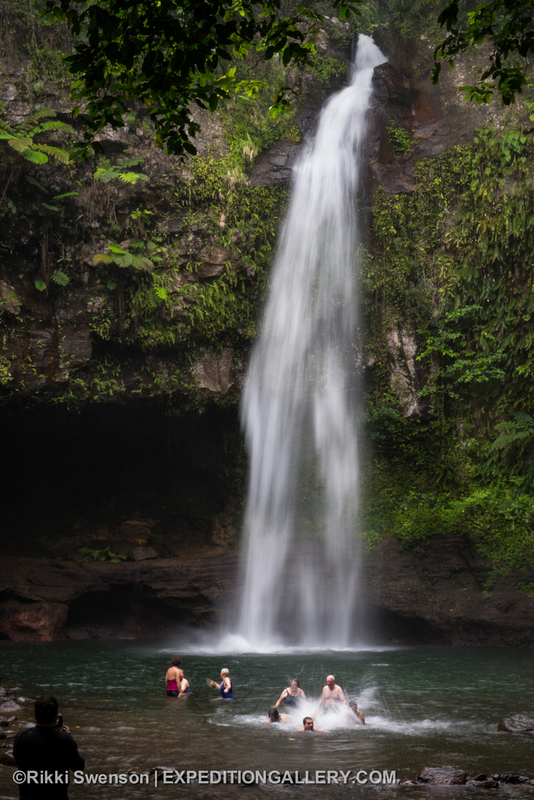 This image: Tavoro Falls within Bouma National Heritage Park, Taveuni Island, Fiji. Rikki acknowledges Jack with a grin and a nod at the well-rehearsed introduction. 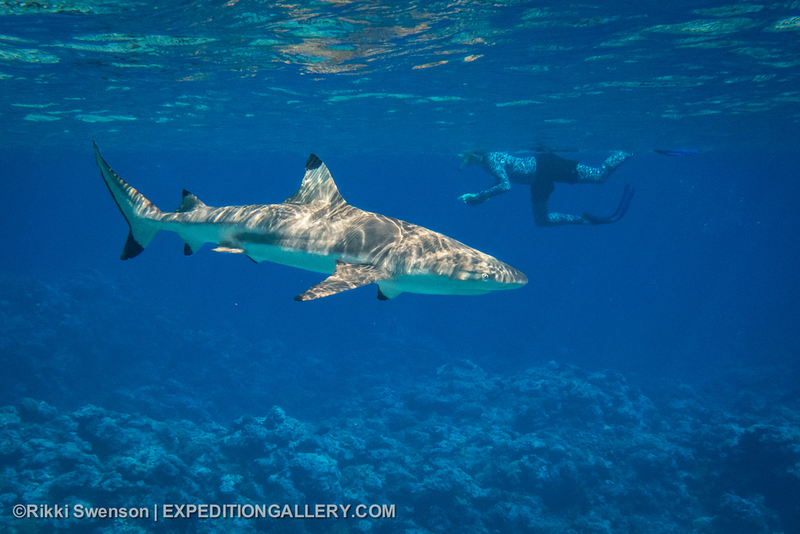 This image: Curious but harmless reef sharks on a reef in the Cook Islands. As for myself, I’ve been a travel photographer for well over 20 years and even managed a couple of awards, but I still find myself listening intently during seminars and digital slideshows held in National Geographic Orion's spacious lounge. We sit enthralled at Jack and Rikki's highlights from several years. Crazy antics of boobies in the Galapagos, breaching humpback whales, mesmerising polar vistas and cavorting cheetahs on the plains of Africa. We are filled equally with admiration and aspiration, hoping that we might capture something comparable during our time aboard. 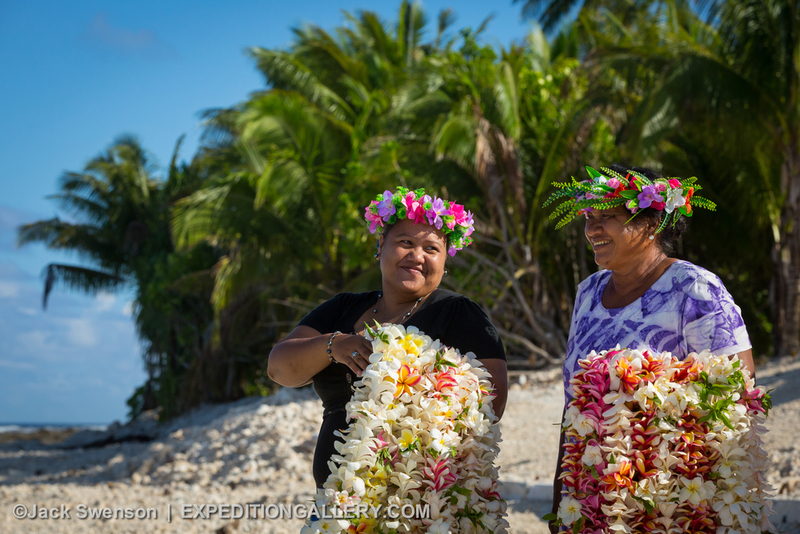 This image: Local women with arms full of flower leis to welcome visitors to Manihiki Atoll in the northern Cook Islands. Here are some of the most important creative tips worth remembering, no matter how experienced you think you are. Shoot for variety. Edit for impact. You'll go home with a more interesting and diverse portfolio from your voyage. Think about telling the story and how your images will convey this. Use a variety of focals lengths to add variety and interest. Use a combination of high, mid and low angles to accentuate your subject. Pay attention to the horizon. Does your subject look best with a low or high horizon? Not sure? Take both. Move the subject around inside the frame and avoid ‘bullseye’ snaps. Insert people into your images to increase viewer interest. 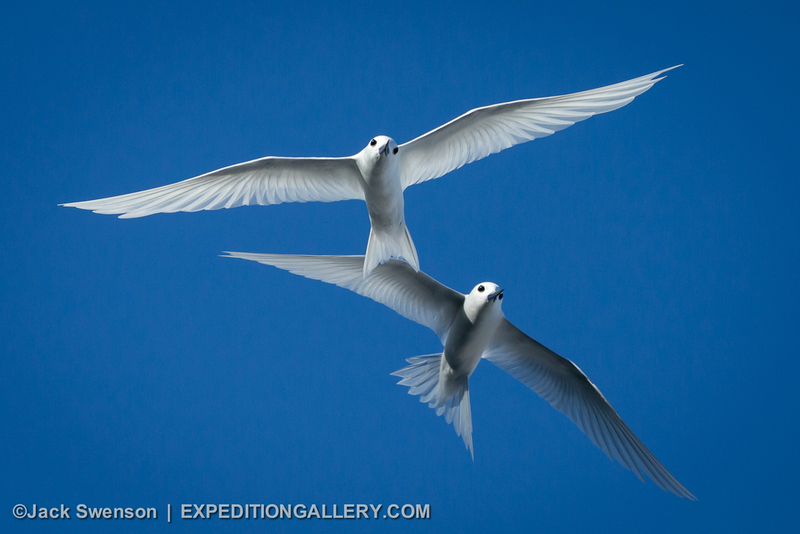 This image: White terns; seabirds that are present on many of the tropical Pacific Islands that we visit. One of the trickiest skills is photographing wildlife in action. Capturing birds in flight, whales and dolphins playing in the ocean, animal interactions or expressions and even tiny insects inside colourful flowers all require knowledge of both technique and equipment. But, don’t worry, it doesn’t matter if you have a simple $100 point-and-shoot, iPhone or top-of-line Canon EOS SLR, Lindblad-National Geographic certified photo instructors like Rikki and Jack will help you improve your photography and enjoy your Lindblad Expedition just that much more.